How do we celebrate the four-year anniversary of our favorite trip ever; one that had us locked in to seven days of tent-camping and whitewater rafting when we’d never done either before? We revisit that destination with a new first-time experience. And how do we follow up rafting through the entire 280 miles of the glorious Grand Canyon and rectify never seeing any of it from the rim? We view it from the air, of course. 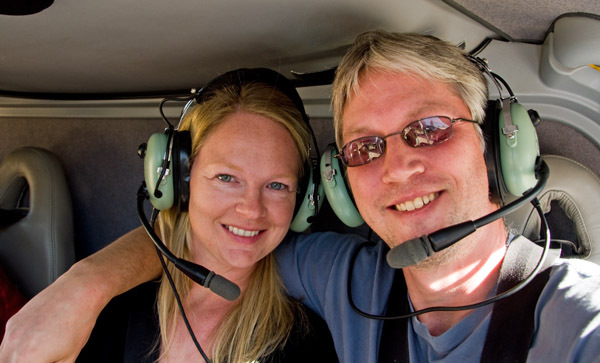 That is how we found ourselves aboard a three-million dollar EC-130 helicopter, flying a mile over the Canyon floor on our very first helicopter ride. To commemorate our inaugural experience in the Canyon, we knew we needed something “big.” Simply heading to the Grand Canyon Visitor Center and shouldering to an overlook along with everyone else wasn’t going to be enough. So we placed a call to Maverick Helicopter Tours, and they hooked us up with an early morning flight out of the South Rim airport terminal. At 140 miles per hour, we cruised over the vast Kaibab National Forest in no time flat. Before we even had a chance to get used to the thrill of the helicopter ride, our pilot told us to “get ready.” Suddenly, the forest speeding by beneath us ended and the entire world fell away. We were no longer flying, it seemed, but floating with the Grand Canyon stretching before us as far as we could see. 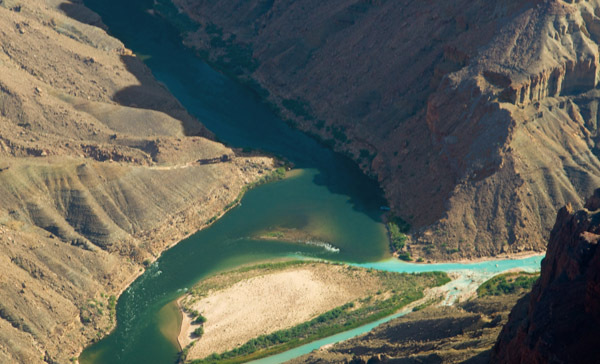 We banked right and followed the Colorado River upstream as our pilot directed our attention to various formations. He pointed out some of the larger rapids, all of which we had become intimately familiar with four years earlier – Hance, Hermit and, of course, the forbidding Crystal. We squinted at the water in an attempt to pick out rafters or kayakers but saw neither. Before long we arrived at a landmark that needed no introduction. The brilliant robin’s egg blue water of the Little Colorado was unmistakable. It’s still our favorite part of the Canyon. Soon the barren dryness so synonymous with Arizona in general, and the Grand Canyon in particular, gave way to lush greenery. The character of the North Rim is different from the South but no less stunning. Turning back south we traveled through the “Dragon Corridor,” the widest and deepest part of the Canyon. But that also meant our 50-minute tour was nearing its end. Too soon we were back on the ground thinking that our helicopter ride was the perfect way to recapture some of the magic of our first Grand Canyon Adventure. and then book a helicopter tour. I love the idea of commemorating the anniversary of a wonderful trip! This looks like it was a great way to celebrate. We’d have a hard time doing better than this, we think . . . which leaves us in a bit of a quandry about what to do four years from now. LOL. Cool – loving your photos! Have a Great Day! Thanks. Have a good one too. Sounds like you had a great ride. We flew over the Grand Canyon in a small plane and had lunch on the rim of canyon. Wonderful. Your photos and story capture that experience. The Grand Canyon sounds wonderful. And I have been reading your blog with interest. I am undertaking my own travelling adventure and, like your kittens, I too had commitments – a job I like, an aged father and 3 almost-grown-up daughters. So I started walking around the coast of the UK. Nearly 1,000 miles under my boots. Still going. Hope you come to Europe on your travels one day…. We love Europe and the UK. We’re definitely coming back, although the Schengen Visa limitations make it hard for us to travel around as much as we’d like. This looks like it was a wonderful experience! Thanks for sharing the video and awesome photos!! 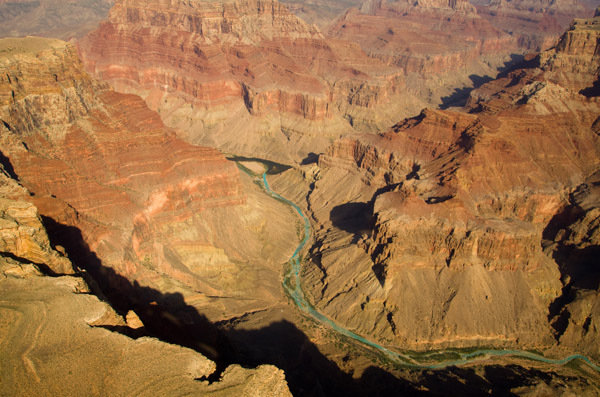 I have always been fascinated by Grand Canyon (GC) ever since I saw the movie, 127 Hours. But this one is a killer to me. The aerial view is rarity and you just give me another “tasty” piece of of GC. Kudos to that. The helicopter ride is, beyond question, a perfect ride.